Media Grid standards, technologies and initiatives (such as Immersive Education) are developed by an international collaboration of universities, colleges, research institutes, consortia and companies. To join or for more information contact the Media Grid standards group director. The Media Grid is a computational grid platform that provides digital media delivery, storage and processing (compute) services for a new generation of networked applications. Built using Internet and Web standards, the Media Grid combines Quality of Service (QoS) and broadcast features with distributed parallel processing capabilities. Together these features create a unique software development platform designed specifically for networked applications that produce and consume massive quantities of digital media. The Media Grid is powered by service providers (such as rendering farms, clusters, high-performance computer systems, computational grids, and similar systems) that furnish on-demand services to Media Grid clients (users). As an open and extensible software development and delivery platform the Media Grid is designed to enable a wide range of applications not possible with the traditional Internet and World Wide Web. Applications enabled by the Media Grid include: Immersive Education; on-demand digital cinema and interactive movies; distributed film and movie rendering; truly immersive multiplayer games and virtual reality; real-time visualization of complex data (weather, medical, engineering, and so forth); telepresence and telemedicine (remote surgery, medical imaging, drug design, etc. ); vehicle and aircraft design and simulation; and similar high-performance media applications. The Media Grid is modeled after an improved national power grid, with added security and stability features that eliminate downtime and blackouts. As with the national power grid, which standardizes the production and consumption of power in the United States, the Media Grid establishes open software standards that enable computer applications to “plug in” to digital media delivery and processing services over the global Internet. Applications that only need to consume media content or access media processing services can do so at a fair and standardized price, while the owners of computers that host and deliver media or provide media processing services receive compensation for their contribution to the grid. Visit the Immersive Education Initiative news page for all current news. 2010-11: "Create Once, Experience Everywhere" 3D/VR Format Unveiled for Immersive Education. The Immersive Education Initiative today unveiled iED 3D/VR, the open and royalty-free cross-platform 3D/VR mesh file format that enables 3D and virtual reality (3D/VR) content to be created once and experienced across a range of virtual worlds, games, simulators and mixed/augmented reality applications. The culmination of over 2 years of work conducted through the Open File Formats Technology Working Group (OFF.TWG), iED 3D/VR is aligned with the COLLADA standard and supported by official iED virtual world platforms realXtend, Open Wonderland, Open Simulator ("OpenSim") and Open Cobalt in addition to the candidate iED platform Sirikata. A range of hands-on workshops will be given at iED 2011 to teach educators how to create cross-platform 3D/VR content using a variety of authoring tools, including Google SketchUp and Blender, and starting immediately virtual training sessions will be provided to Initiative members online and free of charge. 2010-10: iED 2011 EARLY REGISTRATION OPENS. 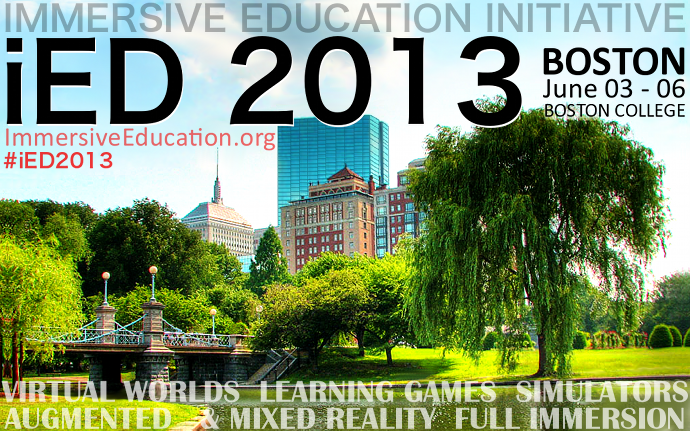 World's leading immersive learning experts and practitioners convene May 13-15 in Boston. The Immersive Education Initiative today opened early registration for iED SUMMIT 2011 ("iED 2011"). Boston College will host the three-day iED Summit from May 13-15 through special arrangement with the Woods College of Advancing Studies at Boston College. Early registration, and associated individual and group discounts, will close this December. Speakers at past iED Summits have included faculty, researchers, and administrators from The Grid Institute, Boston College, Harvard University (Harvard Graduate School of Education, Berkman Center for Internet and Society at Harvard Law School, and Harvard Kennedy School of Government), Massachusetts Institute of Technology (MIT), MIT Media Lab, The Smithsonian Institution, Loyola Marymount University, Stanford University, United States Department of Education, National Aeronautics and Space Administration (NASA), Federation of American Scientists (FAS), Duke University, Temple University, Southeast Kansas Education Service Center, Immersive Education High School, Cornell University, Amherst College, Kauffman Foundation, Boston Library Consortium, Montana State University, South Park Elementary School, Boston Media High School, Sun Microsystems, Turner Broadcasting, Open Wonderland Foundation, realXtend (Finland), The MOFET Institute (Israel), University of Aizu (Japan), Keio University (Japan), National University of Singapore, Royal Institute of Technology (Sweden), University of Essex (UK), Coventry University (UK), Giunti Labs (Italy) and European Learning Industry Group, Open University (UK), and more. 2010-10: iED 2011 CALL FOR PAPERS AND PRESENTATIONS. World's leading immersive learning experts and practitioners convene May 13-15 in Boston. The Immersive Education Initiative today issued an open call for iED Summit 2011 papers, posters, workshops, panels, general presentations, demos, and outliers (novel late-breaking research and technology). Boston College will host the three-day iED Summit from May 13-15 through special arrangement with the Woods College of Advancing Studies at Boston College. Speakers at past iED Summits have included faculty, researchers, and administrators from The Grid Institute, Boston College, Harvard University (Harvard Graduate School of Education, Berkman Center for Internet and Society at Harvard Law School, and Harvard Kennedy School of Government), Massachusetts Institute of Technology (MIT), MIT Media Lab, The Smithsonian Institution, Loyola Marymount University, Stanford University, United States Department of Education, National Aeronautics and Space Administration (NASA), Federation of American Scientists (FAS), Duke University, Temple University, Southeast Kansas Education Service Center, Immersive Education High School, Cornell University, Amherst College, Kauffman Foundation, Boston Library Consortium, Montana State University, South Park Elementary School, Boston Media High School, Sun Microsystems, Turner Broadcasting, Open Wonderland Foundation, realXtend (Finland), The MOFET Institute (Israel), University of Aizu (Japan), Keio University (Japan), National University of Singapore, Royal Institute of Technology (Sweden), University of Essex (UK), Coventry University (UK), Giunti Labs (Italy) and European Learning Industry Group, Open University (UK), and more. 2010-06: Call For Psychologically Beneficial Immersive Environments. The Immersive Education Initiative's Psychology of Immersive Environments Technology Working Group (PIE.TWG) today issued an open call for psychologically beneficial immersive environments. The results of this call and related PIE.TWG activities will establish a searchable repository of psychologically beneficial virtual worlds, simulations, video games, mixed/augmented reality applications in addition to leading papers, case studies, and research in the field. The purpose of the repository is to 1) provide examples of best practices to promote psychologically beneficial effects of immersive environments, 2) showcase state-of-the-art applications of immersive technologies and platforms in the field of psychology, and 3) provide a functional sub-set of the Education Grid dedicated specifically to psychology. 2010-05: Outcomes Of 2010 Boston Summit Posted By Immersive Education Initiative The Immersive Education Initiative today posted outcomes of the 2010 Boston Summit that convened April 23-25 at Boston College through special arrangement with the Woods College of Advancing Studies. Organized specifically for educators, researchers, and administrators, the three-day conference consisted of presentations, panel discussions, break-out sessions and workshops to provide attendees with an in-depth overview of immersive learning platforms and technologies. 2010-04: Immersive Education Initiative Issues Call For Expert Legal Opinions On Second Life. The Immersive Education Initiative today issued an open call for expert legal opinions on content ownership, terms of service, and potential legal liabilities for teaching in the virtual world of Second Life. The Initiative issued its call to the international legal community in response to new Second Life terms of service that went into effect today and a growing concern for legal liabilities for educators and schools that require students to enter and reside in a public virtual world populated with anonymous users and potentially offensive content. 2010-04: Boston College Advancing Studies Undergraduate Course Catalog Goes Immersive. During his opening address at the Immersive Education 2010 Summit, James A. Woods, Dean of Boston College's Woods College of Advancing Studies, today announced that the college's undergraduate courses will be offered as fully immersive distance learning classes through the Immersive Education Initiative. Starting with 4 classes this fall, the entire Woods College of Advancing Studies course catalog is expected to become fully immersive over the next five years. Standard Boston College credit is issued for immersive Advancing Studies courses, with no distinction made between the amount or form of credit given for traditional in-person classes. Students enrolled in immersive classes attend entirely within an online immersive learning environment, using open and freely available technologies endorsed by the Initiative, and may therefore reside anywhere in the world. 2010-03: BOSTON SUMMIT EXCLUSIVE: Attendees To Receive $2,500 In Permanent Virtual World Land. The Immersive Education Initiative today announced that it will provide permanent virtual world land for one year to every school and non-profit organization that has at least one teacher, administrator or student in attendance at the 2010 Boston Summit this April. The land, a full region of space measuring 256x256 meters in size (65,536 square meters), would cost nearly $2,500 in Second Life at the normal educational rate ($700 plus $1770 in annual maintenance fees). The free land can be renewed each year, also free of charge, by simply attending any Immersive Education Initiative Summit. 2010-03: BOSTON SUMMIT EXCLUSIVE: ROCKET WORLD TO BE FREELY AVAILABLE. The Immersive Education Initiative today announced that all software and virtual worlds that comprise Rocket World will be distributed freely at the Immersive Education 2010 Summit at Boston College April 23-25. Hands-on workshops at the Summit will provide attendees with instruction on how to: 1) INSTALL ROCKET WORLD AND OTHER VIRTUAL WORLDS "BEHIND THE FIREWALL" ON SCHOOL NETWORKS FOR PRIVATE, SECURE AND COST-FREE IMMERSIVE LEARNING EXPERIENCES, 2) ACCESS AND TEACH USING FREELY AVAILABLE INSTANCES OF ROCKET WORLD ALREADY INSTALLED ON THE EDUCATION GRID, and 3) COPY OR MOVE ANY SECOND LIFE ISLANDS, REGIONS, PARCELS AND OBJECTS THAT THEY OWN ONTO PRIVATE, SECURE AND FREELY AVAILABLE OPEN SOURCE VIRTUAL WORLD SERVERS THAT ARE OWNED AND OPERATED ENTIRELY BY THEIR SCHOOL. Summit attendees will also receive permanent virtual world land on which to build their own immersive education experiences, together with training on how to copy or migrate their Second Life content onto The Education Grid as well as onto their own privately hosted virtual world servers. 2010-02: Chronicle of Higher Education article: After Frustrations in Second Life, Colleges Look to New Virtual Worlds Some colleges that have built virtual classrooms in Second Life—the online environment where people walk around as avatars in a cartoonlike world—have started looking for an exit strategy. The virtual world has not lived up to the hype that peaked in 2007, when just about every day brought a new announcement from a college entering Second Life. Today, disenchanted with commercial virtual worlds but still convinced of their educational value, a few colleges have started to build their own, where they have more control. 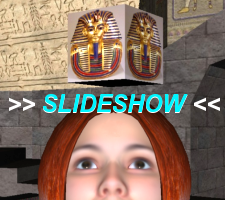 NOTE: This article presents two official Immersive Education Initiative alternatives to Second Life: OPEN COBALT and OPEN SIMULATOR. By mandate the Immersive Education Initiative's "Platform Ecosystem" consists only of freely available open source technologies. Open Wonderland, Open Cobalt, Open Simulator (OpenSim) and realXtend are the official Immersive Education Initiative virtual worlds platforms. Additionally, an enhanced descendant of the open source Second Life viewer (client-side end user software) is paired with open source virtual world servers to provide educators with a fully open, cost-free alternative to Second Life. 2009-12: Immersive Education 2010 Summit. The Immersive Education Initiative today announced that early registration for the 2010 Boston Summit is now open. Boston College will host the Immersive Education 2010 Boston Summit from April 23-25 through special arrangement with the Woods College of Advancing Studies at Boston College. Organized specifically for educators, researchers, and administrators, the three-day conference consists of presentations, panel discussions, break-out sessions and workshops that provide attendees with an in-depth overview of immersive learning platforms and technologies. The Summit will feature new and emerging virtual worlds, learning games, educational simulations, mixed/augmented reality, and related teaching tools, techniques, technologies, standards and best practices. The Education Grid, Open Wonderland, Open Cobalt, Open Simulator (OpenSim) and realXtend are among the immersive learning technologies that will be featured. Members of the Initiative's open file format, library, psychology, mixed reality, and K-12 (kindergarten through high school) groups will give special presentations and workshops. 2009-10: Immersive Education Days at University of Oregon. The Immersive Education Initiative today announced that it will sponsor the 1st University of Oregon Immersive Education Days (UOiED). The event is co-hosted by the University of Oregon's Information Services and the College of Education's new Center for Learning in Virtual Environments (CLIVE) for two full-days of presentations. Educators, researchers and administrators from University of Oregon, Boston College, Lane Community College, Bowling Green State University, Indiana University, University of Essex, St. Paul College, San Jose State University, and Loyalist College will give a series of live and virtual presentations, providing attendees with an overview of Immersive Education virtual world and game-based learning technologies. In addition the Immersive Education Days staff will host an Alternate Reality game called "Eugene vs. The EcoZombies" on the campus. 2009-09: "Rocket World" space-themed immersive learning system launched on the 40th anniversary of the first moonwalk. Rocket World is a comprehensive immersive learning framework and core immersive STEM (science, technology, engineering, math) curricula designed to inspire and educate a new generation of scientists, engineers and researchers through the novel application of next-generation learning technology. Rocket World is specifically designed to engage students of all ages and teach core STEM concepts using a new generation of learning technology that includes virtual worlds, simulators, learning games, and mixed (augmented) reality that together immerse students in rich and collaborative space-themed learning experiences. The Initiative launched Rocket World on the 40th anniversary of the first moonwalk, and today announced that the space-themed immersive learning system will be freely available to all levels of teachers, students, scientists, engineers and researchers worldwide. 2009-08: NEWSWEEK ARTICLE: The Sound of One Hand Clicking - Online schools are booming, thanks to their convenience, low cost, and improved quality. "...Online offerings these days can sometimes even surpass the classroom experience. Aaron Walsh, a professor at Boston College and a former videogame designer, has pioneered Immersive Education, a method of teaching through virtual worlds. Meeting in [Immersive Education virtual worlds] instead of a physical classroom, says Walsh, allows for some feats that gravity renders impossible, like having art-history students fly to the ceiling of the Sistine Chapel or biology majors to take a Magic Schoolbus-like trip through the human body. Using videos, podcasts, live chats, Webcams, and wikis, educators increasingly see online learning as a way to engage the videogame generation with pedagogy that feels more like entertainment than drudgery..."
2009-07: SNEAK PEEK: Immersive Education Initiative's "Mixed Reality Learning Table" unveiled. A breakthrough in interactivity, the Immersive Education Mixed Reality Table (iED Table) merges 3D virtual objects and environments with physical objects from the real world. The iED Table dramatically changes the way in which students interact with computer-based learning environments by combining, or 'mixing,' the real world with the virtual world. Using either a traditional computer display, or by wearing 3D goggles, students can interact physically with a 3D immersive virtual environment that "pops up" from any 2D surface, such as a table, desk, wall, or even the floor. 2009-07: Director of Immersive Education Initiative presented with Innovator's Award prior to delivering Campus Technology 2009 keynote address. Aaron E. Walsh, Director of the Immersive Education Initiative, was presented with the Campus Technology Innovator's Award prior to delivering the keynote address at the Campus Technology 2009 conference. Walsh was presented with the Campus Technology Innovator's award for his contributions to the field of Immersive Education, a term that describes the combination of interactive 3D graphics, commercial game and simulation technology, virtual reality, voice chat, Web cameras, and rich digital media with collaborative online course environments and classrooms. Walsh, who coined the term immersive education, then took attendees on a fast-paced journey of innovation, though his past twenty years developing new forms of learning technology that together enable the age of immersive education we are in today. 2009-04: The Immersive Education Initiative today announced that the London Summit will be free for students. On April 23rd and 24th the London School of Economics (LSE) will host the Immersive Education Initiative's London Summit, a special two-day event showcasing new and emerging virtual worlds, learning games, educational simulations, and related tools, techniques, technologies, standards and best practices. The per-seat cost of the two-day London Summit is £195 (pound sterling), or $275 USD (U.S. dollars). Students can attend free of charge by following the instructions on the registration page at MediaGrid.org/summit. 2009-03: Immersive Education Initiative LONDON SUMMIT to Launch Series of European Events. The Immersive Education Initiative today announced that it will launch its series of Immersive Education: Europe events in London this April. On April 23rd and 24th the London School of Economics (LSE) will host the Immersive Education Initiative's London Summit, a special two-day event showcasing new and emerging virtual worlds, learning games, educational simulations, and related tools, techniques, technologies, standards and best practices. Designed specifically for educators, researchers, and administrators, the London Summit consists of presentations, panel discussions, break-out sessions and workshops that provide attendees with an in-depth overview of immersive learning platforms and technologies such as The Education Grid, Wonderland, Second Life, Cobalt, realXtend, Alice, Open Simulator (OpenSim), augmented and mixed reality, and more. 2008-12: Media Grid Launches Library Technology Working Group (LIB.TWG) for Immersive Education. The Media Grid this month launched the Library Technology Working Group (LIB.TWG) to define, implement, evolve and maintain applications and open standards related to the provision of library services associated with Immersive Education. Participation in the Library TWG is open to the public and members of the Immersive Education Initiative having experience with real-world or digital libraries, or extensive experience developing or using virtual worlds, simulators or video games. Access to the Library TWG is available through the group charter at http://mediagrid.org/groups/technology/LIB.TWG/. 2008-11: Immersive Education Initiative Launches Asia Series of Events in Japan. The Immersive Education Initiative today announced that it will launch its series of Immersive Education: ASIA events in Japan this month. Immersive Education Japan (iED Japan) begins with "Immersive Education Days at University of Aizu", which features two days of Immersive Education presentations, lectures, workshops and related events presented by faculty, teachers and researchers from around the world who are participating in the event in person and remotely using virtual worlds technology. During the event, which spans November 18th through the 20th, Immersive Education Initiative members from Boston College, University of Aizu, National University of Singapore, Keio University, Smithsonian Institution, Montana State University, Southeast Kansas Education Service Center at Greenbush, University of Essex and Sun Microsystems will give a series of presentations and demonstrations to provide attendees with an in-depth overview of Immersive Education, the Education Grid and related technologies. 2008-10: Open File Formats Technology Working Group (OFF.TWG) Launches. The Media Grid Open File Formats Technology Working Group is responsible for defining, evolving and maintaining open, platform-neutral file formats that enable learning objects and experiences to be seamlessly deployed across Immersive Education technology platforms. Today's virtual worlds, simulators and learning games are essentially walled gardens; users are not able to interact with the same objects or experiences from different platforms, nor are users of one platform able to interact with users residing in another platform. The Open File Formats Technology Working Group is actively standardizing cross-platform content interchange by adopting and promoting open, platform neutral 3D/VR file formats that enable the promise of "create once, experience everywhere." 2008-08: Immersive Education Initiative Launches South America Series of Events. The Immersive Education Initiative today launched its series of Immersive Education: South America events. Today's "Immersive Education Day at Fundación Universitaria Sanitas" event connects over 200 delegates attending the conference in Bogota, Colombia, with faculty, teachers and researchers from around the world who are participating in the event remotely using virtual worlds technology. During the event Immersive Education Initiative members from Boston College, Cornell University, Montana State University, Southeast Kansas Education Service Center at Greenbush, National Oceanic and Atmospheric Administration (NOAA), Media Communications Technology High School, and Sun Microsystems will give a series of presentations and demonstrations to provide attendees with an in-depth overview of Immersive Education. 2008-08: Newsweek International features Director of the Media Grid and Immersive Education Initiative. Newsweek International's SPECIAL REPORT: THE EDUCATION RACE features Aaron E. Walsh, Director of the Media Grid and Immersive Education Initiative. The special report by Newsweek examines how technology and higher gas prices are driving a boom in online and education across the United States. 2008-06: Immersive Education Initiative Launches The Education Grid. The Immersive Education Initiative today launched the Education Grid with an early preview of Sun Microsystems Laboratory's Project Wonderland virtual world servers ("nodes") hosted by Essex University (United Kingdom), University of Oregon, St. Paul College, New Media Consortium (NMC), Common Need, and Sun Microsystems. The Education Grid is a free public utility provided by the Immersive Education Initiative and its members. Starting today initiative members have early access to the Education Grid, where they can conduct classes and meetings within a growing collection of virtual worlds. Initiative members can also use the Education Grid to build custom virtual learning worlds, simulations, and learning games. 2008-06: Immersive Education Initiative Celebrates 1st Birthday in the Virtual World, Expands in the Real World. The Immersive Education Initiative, in celebration of its first anniversary and a number of recent accomplishments, will throw a virtual 1st birthday party tonight for its members and the public as it looks forward to the year ahead. Immersive Education was conceived in 2005 as an application of the Media Grid. The corresponding initiative was officially launched one year ago today, with an open call to educators, students, and professionals who had experience using virtual learning environments or video game technologies. In the year since the initiative was started it has grown to more than 200 members from around the world. 2008-03: Immersive Education Initiative receives $1.2 Million STEM donation from the John C. Ford Program. [PDF format] The Ford Program donates 67 STEM programs and associated learning materials and technologies to the Immersive Education Initiative under an Open Educational Resources (OER) Creative Commons license. The donation, valued at $1.2 Million USD, was developed with funding by the United States Department of Commerce, W.K. Kellogg Foundation, Dallas Foundation, COMP USA, EDS Foundation, Bank of America Foundation, Microsoft Corporation, Chase Bank and private investors. The donation provides the Immersive Education Initiative with a solid base of STEM programs from which a range of next-generation applied engineering immersive learning experiences will be developed. 2008-02: eWEEK article: Sun Explains New Strategy for Education. Sun Microsystems has seen the future of education, and it can be viewed right there on a desktop monitor. Scott McNealy, Sun's chairman of the board, explained his take on this topic Feb. 28 at Sun's annual education summit here at the Westin St. Francis. Some 1,000 school district, K-12, college and university IT administrators were on hand at the Worldwide Education and Research Conference to hear about the latest in technology for the classroom. McNealy described an intriguing initiative with which Sun has become involved, called immersive education. 2008-01: Virtual Worlds News interview: Media Grid to Take Education Across the Virtual World—and the XO. Media Grid recently announced its plans to roll out a cross-platform, immersive world for education for academics, students, and trainers everywhere. After experimenting with VRML, the Unreal Engine, and other tools since 2001, the organization realized that it needed to begin looking beyond simply one platform. It formed the Immersive Education Initiative and looked for options. 2008-01: Immersive Education Initiative announces Education Grid and Platform Ecosystem at Boston Summit. [PDF format] During the 2008 Boston Digital Media Summit last week the Immersive Education Initiative announced the Education Grid and corresponding Platform Ecosystem. Based upon open source technologies and open standards, the Education Grid and Platform Ecosystem will provide educators with a comprehensive end-to-end infrastructure for a new generation of virtual world learning environments, interactive learning games, and simulations. 2008-01: Daily Hampshire Gazette front page article: Educators Find Engaging Tool in Virtual 'Immersive' Learning. It's one thing to read about the International Space Station; it's another to dock a spaceship in its port. Immersive Education, a new and free library of online educational games and 3-D programs, wants to give students the opportunity to experience what they learn in school - virtually. Fly a spaceship, play the role of Israel's prime minister, walk through an Egyptian tomb, hangout in a Paris cafe and order a baguette in French - it's all achievable through Immersive Education. 2008-01: Immersive Education the focus of 2008 Boston Summit. [PDF format] On January 12th and 13th educators, researchers, administrators and students from Boston College, Boston Public Schools, Amherst College, Federation of American Scientists, MIT Media Lab, Harvard University, Duke University, United States Department of Education, New Media Consortium (NMC), Johnson & Wales University, NASA, Sun Microsystems, Synthespian Studios, and Computerworld will give a series of presentations, panel discussions and workshops that provide an in-depth overview of Immersive Education. 2007-12: Chronicle of Higher Education article: Immersive Education Submerges Students in Online Worlds Made for Learning. Students at Boston College stumbled across a jackal in the underground chambers of an ancient Egyptian tomb in early December. One student explained that the animal was the god Anubis, who helped transport dead bodies to the underworld. In reality, the students never left the Boston area. Their trip was showcased at a conference at Harvard University this month devoted to Immersive Education, a multimillion-dollar project to build virtual-reality software exclusively for education within commercial and nonprofit fantasy spaces like Second Life. 2007-12: Educating Virtual Worlds (podcast). "Maybe there is a chance to get real world value out of virtual worlds" concludes eWEEK Chief Technology Analyst Jim Rapoza. In this Tech Rising podcast, eWEEK Chief Technology Analyst Jim Rapoza talks to Media Grid Director Aaron E. Walsh about virtual worlds and the Media Grid's efforts to build an open platform that uses multiple virtual worlds as a collaborative meeting space, providing what they refer to as immersive education.